The Royal Mint has issued a special £5 coin honouring 150 years of The Salvation Army. The limited edition coin, available in sterling silver and cupro-nickel (similar to regular British coins), is now available to purchase on the Royal Mint website. The Salvation Army was founded by William and Catherine Booth in London in 1865. Social reformers, the Booths created a church that focused on caring for people in a practical way and helping those living in poverty. The coin is to be struck for Alderney in the Channel Islands, and was first minted on Wednesday 27 May by Lieut-Colonel Eddie Hobgood (International Congress Coordinator) and Major John Murray (International Headquarters Communications and Literary Secretary). A Royal Mint representative says that, having made contact with their colleagues around the world, they believe this is the first Salvation Army coin created by an official mint. Director of Commemorative Coin and Medals, Shane Bissett, says: "This is a wonderful opportunity to celebrate the 150th anniversary and evolution of this much-loved organisation – still bringing hope to people today." Lieut-Colonel Hobgood adds, "The Salvation Army is grateful to The Royal Mint for its extraordinary recognition in this, our 150th year." The reverse design for this special 150th anniversary coin was created by Laura Clancy, one of The Royal Mint?s talented designers. Laura studied three-dimensional crafts at the University of Brighton and has previously taught art and metalwork. Her work for The Royal Mint includes various team projects such as works to commemorate the Royal Air Force, the 90th anniversary of the First World War and the Portrait of Britain Collection. Laura's design includes the familiar Salvation Army shield and a laurel wreath. The design was 'inspired by the cheering warmth and familiarity of the Salvation Army brass band playing carols, a distinctive feature of any British high street in the run-up to Christmas'. She said it seeks to make the viewer 'think more deeply about the organisation, and the tireless good work that its volunteers are engaged in all year round'. 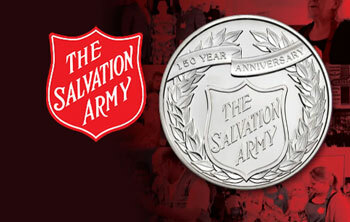 "I felt honoured to work on the design for The Salvation Army coin," says Laura. "It was an opportunity to learn more about the brass bands I remember on wintry days, their tunes warming up the cold and gently letting everyone around know that they are there. I wanted to create a design that commemorates their achievements. Something classic, celebratory and with something we all know and recognise at the heart of it." As with all official British coinage, the 'obverse' side – the 'head' side – contains a portrait of Her Majesty the Queen and the year. The Salvation Army coin is one of the last to feature the fourth portrait of the Queen (the fifth portrait since her ascension to the throne in 1952 came into use on new coins in circulation from March 2015). The coin is being released in two forms, a cupro-nickel version (similar metal content to all silver-coloured UK coins) and a limited-edition sterling silver version. The cupro-nickel coin will sell for £13 and the silver coin – of which only 1,500 are being minted – will cost £80. The coins are available to purchase direct from the Royal Mint and will also be for sale at The Salvation Army's SP&S Shop at its international congress in July.